Issac Newton’s First Law of Motion states the following: “Every object in a state of uniform motion tends to remain in that state of motion unless an external force is applied to it”. 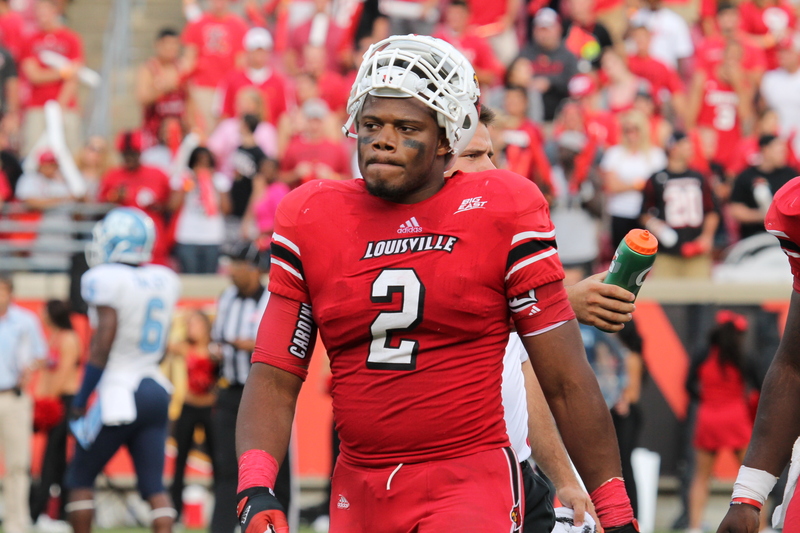 The two football programs of Louisville and Kentucky have been on opposite ends of that law lately. Louisville has been on an upward trajectory of success, no force has been applied to stop this success; none have been able to even stifle it. Kentucky has been spiraling towards the bottom of College Football, Joker Phillips wasn’t the force to stop this free-fall, perhaps Mark Stoops is now? As it stands in the present, the separation between the two programs has never been greater. It’s a contrasting story between been there, done that. The other trying to get there and do that. Mark Stoops has been able to generate a nice recruiting class; at least it appears. Charlie Strong has done that. Mark Stoops is trying to generate fan interest. Charlie Strong instantly captivated the city of Louisville and the Cardinals broke a season ticket sales record this season. Mark Stoops is trying to get Kentucky to a BCS Bowl Game. Charlie Strong has been there and done that. When this series reemerged in the late 90s, it was mutually beneficial for both programs. Louisville needed to help sell out a brand new Papa John’s Cardinal Stadium. Kentucky needed another winnable game on their schedule. It worked for both programs and both administrations had embraced the series. Now, it seems Kentucky has worked to bury or to remove this game from their schedule. They’ve done it through moving the week of the game, thus effecting the time and whether not the game would be seen on TV. Despite their best efforts – it appears – this series will live on after the contract ends next season. Mostly because a mutual decision between the ACC/SEC to move this game to the last week of the season, creating a sort of showcase for the rivalries between the two leagues and a potentially a new ‘home’ for the series. But why has Kentucky tried to consistently change this game placement around? Well Kentucky has had no problem with the game not being on TV. You see, Louisville has won two straight and it appears nothing will get in the way of them winning three straight, four straight, etc. If you erase the three seasons from Kragthrope, Louisville has owned Kentucky Football in dominant fashion. Kentucky recognizes this and if they can’t stop the game from being played; the Cats do their best to stop it from being seen. The point is: Times have changed within this series. Louisville no longer needs this game. Kentucky doesn’t really need it either. But for bragging rights and in-state recruiting the game will go on. And it should. If the Cats win, Kentucky gets to pump their chests with a victory over Louisville. If the Cards win Louisville people around the country say: ‘You were suppose to win, it’s Kentucky’. The myth that Louisville is benefited by playing Kentucky in football is almost as comical as Kentucky’s passing defense. In fact, when Louisville breaks through the chains of Conference purgatory, Kentucky will do more to hurt Louisville’s SOS than help it. It’s Kentucky vs Louisville, it’s a tale of two different programs. It’s a tale of times being changed. It’s a tale of one football’s superiority over the other. And it appears, as long as Charlie Strong is the Louisville Football Head Coach, Kentucky has no choice but to accept it.